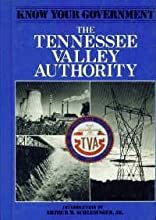 The Tennessee Valley Authority is for Ages 9-12. The Tennessee Valley Authority was written by Alanson A. Van Fleet. The Tennessee Valley Authority was published by Chelsea House Publishers. Subjects of The Tennessee Valley Authority include Children's 12-Up - Politics / Current Events, Children's Books/Young Adult Misc. Nonfiction, Children: Grades 4-6, Educational: Citizenship & social education, Electric utilities, Juvenile Nonfiction, Juvenile Nonfiction / Social Science / Politics & Government, Politics & Government, Social Science - Politics & Government, Tennessee River Valley, and Tennessee Valley Authority. About Alanson A. Van Fleet (Author) : Alanson A. Van Fleet is a published author of children's books. A published credit of Alanson A. Van Fleet is The Tennessee Valley Authority (Know Your Government).